Sciatt are cheese-filled buckwheat fritters from the Valtellina, the same region where the buckwheat pasta pizzocheri come from. The cheese used for sciatt, Valtellina Casera, is also typical for dressing pizzocheri. Although they share the same basic ingredients, the two dishes could hardly be more different, a wonderful example of how method can create incredible variety. 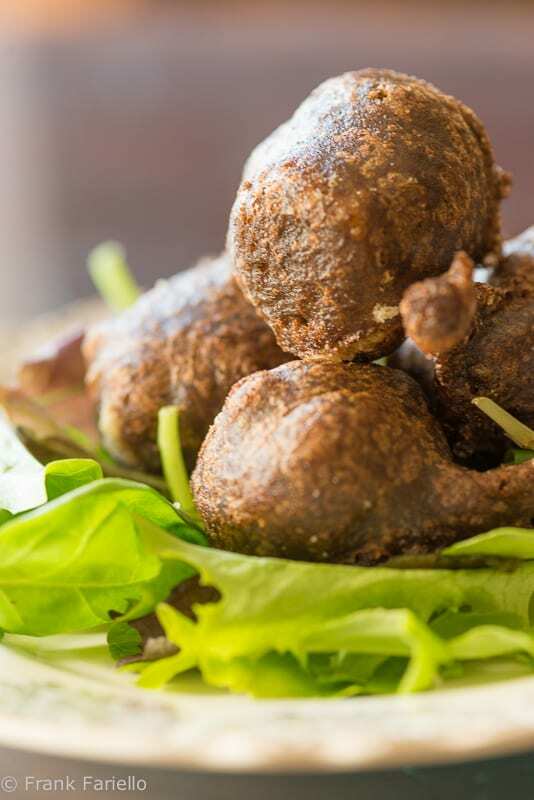 The name sciatt is local dialect for ‘toad’, which these rather dark, irregularly shaped fritters are said to resemble. They make for an unusual antipasto served over a bed of well-dressed salad, or by themselves as a snack. Mix the flours and salt together in a large bowl. Add beer or mineral water in a steady stream, mixing as you go, until you get a smooth but rather thick batter. (The amounts given above worked well for me, but let the consistency be your guide.) Cover and let the batter rest for at least an hour. Cut the cheese into 2cm (1/2 inch) cubes. Drizzle with a bit of grappa. When you are ready to cook, heat the oil until it is quite hot but not smoking. Toss a few cheese cubes into the batter, turn them around until they are well covered in the batter. Then using a spoon, take one cheese cube at a time along with a good helping of batter. Drop it into the hot oil with the help of a second spoon. Make sure you keep your fritters well spaced as they fry; you will probably need to proceed in batches. Turn them in the oil so they cook well on both sides, for no more than a few minutes total. Remove them as they cook with a slotted spoon and let them drain well on a platter lined with paper towels, or a baking rack. Serve your sciatt while still hot over a bed of well-dressed chicory or other green salad, or by themselves. As mentioned, the classic cheese for making sciatt is called casera, a semi-soft cheese of the Alpine type made from winter milk. I’ve never found casera Stateside, so another Alpine-type cheese will have to do; fontina would probably be the closest substitute, although any similar Swiss-type cheese—Emmental, gruyère, even Jarlsberg or generic ‘Swiss cheese’ would make an acceptable substitute. The batter should rest at least one hour, most recipes call for a rest of at least two, and I’ve heard that the batter is even better if left overnight. The 2:1 ratio of buckwheat to white flour given here produces a rather dark fritter; you can alter that ratio if you like to include more white flour, up to 1:1, which produces a lighter, arguably more attractive if perhaps less characteristic, result. Some recipes call for a bit of baking soda or whipped egg whites to give the batter some lift. In many recipes, the batter (rather than the cheese) includes a drizzle of the grappa. The cooking medium in modern recipes is invariably vegetable oil, but one of my favorite cookbooks on the cooking of Lombardy, La cucina lombarda by Alessandro Molinari Pradelli, calls for lard, which I suspect was the original. I like to compromise and add just a few spoonfuls of lard to cooking oil to lend some savor. For the bed of lettuce, the official website of the Valtellina region recommends chicory, although frisée or indeed any good lettuce would, to my mind, do just fine. Sciatt should be eaten hot, as soon as it emerges from the fryer, with its cheesy center fully melted and oozing deliciousness. I’ve tried making it ahead and gently warming it in the oven, but while the fritter itself comes out acceptably crisp, the cheese filling somehow disappears. I have so much catching up to do, reading all the posts I missed recently! First of all, HNY! I love making pizzoccheri but had never heard of these… they sound delicious! It’s an Italian version of a Minnesota cheese curd! When the temps fall below 0 degrees F (like today), I crave anything with melted cheese. I am craving this. I don’t mind ugly! Love the comfort in this. I just googled Minnesota Cheese Curd (which I had never heard of) and you’re right! True comfort food, in both cases. Lovely! I had them only once and they were delicious! And the notes on cheese can turn out very helpful for pizzoccheri too!!! sono stata varie volte in Valtellina ma non li ho mai mangiati, mi sono persa un piatto delizioso ! Hai ragione, Chiara, ma c’è sempre tempo per tornarci, vero? This is one dish from Valtellina I have not yet tasted. I have been there several times when I lived in Milan. It’s a beautiful place and the food is remarkable. Buon Anno anche a te, Simona! It’s true, the Valtellina deserves to be much better known. Ciao Frank, e buon anno a te! I gotta love a guy who fries, and I am pleased to see that you have gotten the 2015 #Frybabe movement off to a terrific and not-so-often seen menu item. These sound delightful – buckwheat and hot oil. It sounds like the name of a Valtellinese blog! in all seriousness, this sounds very good, a savory fried treat. Complimenti!